Dr Drew is a Non-Clinical Lecturer within the Department of Orthopaedic and Trauma Surgery and is also the Distance Learning Coordinator. 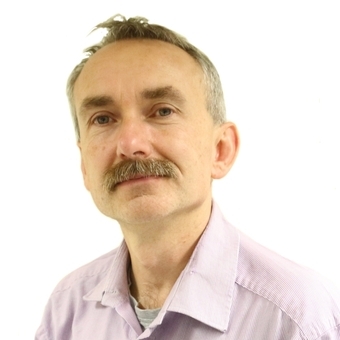 Tim is a Chartered Mechanical Engineer and holds a PhD in Medical Physics from Dundee University, which he completed in 1993, and is a state-registered scientist and chartered engineer. He has extensive experience of the design of medical and laboratory instrumentation, both within the NHS and University sectors. His research interests include the design, development and evaluation of orthopaedic implants and instrumentation. BMJ Open Sport and Exercise Medicine (2018), Volume 4, Issue 1 Frizzell ERA, Arnold GP, Wang W, Abboud RJ, Drew TS. A pilot biomechanical assessment of curling deliveries: is toe sliding more likely to cause knee injury than flatfoot sliding? BMJ Open Sports medicine (2017), doi 10.1136/bmjsem-2017-00021 Robertson I, Arnold GP, Wang W, Drew TS, Nasir S, MacDonald C, Abboud RJ. University of Glasgow Medical Research Society (GMRS) 6th National Conference (2017), November 4th Frizzell E, Arnold GP, Wang W, Drew TS, Abboud RJ. Shoulder & Elbow (2016), 8(3): 184-191 Mohandhas BR, Makaram N, Drew TS, Wang W, Arnold GP, Abboud RJ. Hand Therapy OnlineFirst (2015), March 3, doi:10.1177/1758998315574352 Mifsud C, Drew TS. Career in Surgery Conference. (2013), The Royal Society of Medicine, London, UK. Lim JW, Jariwala AC, Wigderowitz CA, Drew TS. British Orthopaedic Research Society (BORS) / Bone Research Society (BRS) Joint Meeting. (2013), Examination School, Oxford, UK. Lim JW, Jariwala AC, Wigderowitz CA, Drew TS. Orthopaedics (2013), 36(11):e1346-52 Lam L, Drew TS, Boscainos P.
Tayside Orthopaedic Research Club (T.O.R.C) Meeting. (2012), University of Dundee, UK. Winner of Best Poster. Lim JW, Jariwala AC, Wigderowitz CA, Drew TS. British Journal of Sports Medicine (2012), 29, 10.1136 Kuster D, Gibson JNA, Abboud RJ, Drew TS. Foot & Ankle Surgery (2011), 17:218-223 Ramanathan AK, Parish EJ, Arnold GP, Drew TS, Wang W, Abboud RJ. The Foot (2011), 21(1):31-36 Ramanathan AK, Wallace DT, Arnold GP, Drew TS, Wang W, Abboud RJ. Journal of Prosthetics & Orthotics (2011), 23(3), pp.144-148 Kerr E, Moyes K, Arnold GP, Drew TS. International Conference on Clinical Biomechanics at Staffordshire University Campus, Stoke-on-Trent, UK, April (2010), Wilkinson A, Paterson B, Bogacz A, Drew T.
Emergency Medical Journal (2010), Menelaws S, Bogacz AR, Drew TS, Paterson BC. J Biomech (2010), 43(S1): s59 Lam L, Drew T, Boscainos P.
Does mechanical vibration optimize macro-interlock in cemented arthroplasty? Current Orthopaedic Practice (2009), Volume 20, Issue 3: p285-290 Talih S, Drew TS, Henderson S, Theaker E, Abboud RJ. Journal of Orthopaedic Research (2009), 27(3):318-324 Kerr R, Arnold GP, Drew TS, Cochrane LA, Abboud RJ. Clinical Biomechanics (2008), 23:688 Putti AB, Arnold GP, Cochrane LA, Drew TS, Abboud RJ. Clinical Biomechanics (2008), Arnold GP, Cochrane LA, Drew TS, Abboud RJ. Journal of Bone and Joint Surgery (2008), Vol 91-B, Issue SUPP_II, 294 Drew TS, Talih S, Theaker E, Henderson S.
British Journal of Sports Medicine (2008), 42:189-193 Clinghan R, Arnold GP, Drew TS, Cochrane LA, Abboud RJ. Surgical Endoscopy (2008), pp.467-471 Hanna GB, Drew TS, Arnold GP, Fakhry M, Cuschieri A. Association for Medical Education in Europe (AMEE) (2004), Drew TS, Christie IS, Cochrane LA, Abboud RJ. Acta Otolaryngol (2004), 176-178 White P, Nassif R, Saleh H, Drew TS. 2nd Clinical Biomechanics Conference (2004), Rao DV, Cochrane LA, Drew TS, Abboud RJ. (2003), ISBN 1-903562-19-8 Drew TS, Christie IS. Journal of Injury (2002), 33:685-689 Drew TS, Allcock P.
(2001), ISBN 1-903562-10-4, Drew TS, Rowley DI, Abboud RJ. (1999), ISBN 1-899476-96-2, Dolan MJ, Drew TS. Royal College of Surgeons England (1999), 81:2,124-6 Mills RP, Drew TS, Ann R.
Surgical Endoscopy (1998), 12:335-337 Hensman G, Hanna GB, Drew TS, Moseley H, Cuscheri A.
Physiological Measurement (1998), 19:427-440 Drew TS, Vardy A.
Annals of Surgery (1997), 4:120-124 Hanna G, Drew TS, Cuscheri A. Medical Engineering and Physics (1996), Vol.18:251-261 Drew TS, Vardy S, Tarnow-Mordi W, Lerski R.
Surgical Endoscopy (1996), Vol.10:pp.965-969 Hanna GB, Drew TS, Clinch P, Hunter B, Shimi S, Dunkley MP, Cuschieri A.
Frontiers of Biological and Life Sciences (2014), 2(2): 29-33 Lim JW, Jariwala AC, Wigderowitz CA, Drew TS. Scottish Musculoskeletal Meeting, Dunblane, Scotland, UK. (2013), First Prize - Research Section Lim JW, Jariwala AC, Wigderowitz CA, Drew TS. 5th SCALPEL Undergraduate Surgical Conference, University of Manchester, UK (2013), Lim JW, Jariwala AC, Wigderowitz CA, Drew TS. British Orthopaedic Research Society, Annual Congress, Dublin (2011), Gibson JNA, Drew TS, Vettorato E, Schoffmann G, Clutton RE, Burke JG. Proceedings of The British Orthopaedic Research Society, Cambridge (2011), Drew TS, Gibson JNA, Burke J. Proceedings of the 4th Annual International Congress on Early Onset Scoliosis and Growing Spine (2010), Burke JG, Drew TS, Clutton RE, Gibson JNA. International Conference on Orthopaedic Surgery, Biomechanics and Clinical Applications & Surgery, London, UK (2010), Lam L, Drew T, Boscainos P.
Scottish Society for Experimental Medicine, Dundee (2010), Lam L, Boscainos P, Drew T.
Do shoes expose wearers to lateral ankle injury? 8th Clinical Movement Analysis Society (CMAS) (2009), Kerr R, Arnold GP, Drew TS, Gibbs S, Abboud RJ. Spring Scientific Conference of the College of Emergency Medicine (2009), Menelaws S, Drew TS, Paterson B, Bogacz A.
ESM International Conference on load distribution (2008), Ramanthan AK, Bentley JA, Arnold GP, Cochrane LA, Drew TS, Abboud RJ. ESM International Conference on Load Distribution (2008), Talih S, Drew TS, Abboud RJ. Leiden International Medical Student Conference "key to the future" (2007), Clinghan R, Arnold GP, Drew TS, Cochrane LA, Abboud RJ. Shoes: do they protect or damage our feet? Leiden International Medical Student Conference "key to the future" (2007), Parish E, Wallace D, Arnold GP, Drew TS, Cochrane LA, Abboud RJ. 18th European Students' Conference (2007), Clinghan R, Arnold GP, Drew TS, Cochrane LA, Abboud RJ. 4th Clinical Biomechanics Conference (2006), Kerr R, Arnold GP, Cochrane LA, Drew TS, Abboud RJ. EMED Scientific Meeting (2006), Clinghan R, Arnold GP, Cochrane LA, Drew TS, Abboud RJ. 5th World Congress of Biomechanics (2006), Wadha M, Drew TS, Abboud RJ, Wigderowitz CA. 5th World Congress of Biomechanics (2006), Birudavolu C, Arnold GP, Drew TS, Abboud RJ. 5th World Congress of Biomechanics (2006), Kerr R, Arnold GP, Cochrane LA, Drew TS, Abboud RJ. 4th Clinical Biomechanics Conference (2006), Clinghan R, Arnold GP, Cochrane LA, Drew TS, Abboud RJ. Do running shoes go the distance? International Society of Prosthetists and orthotists (2006), Clinghan R, Arnold GP, Cochrane LA, Drew TS, Abboud RJ. International Society of Prosthetists and Orthotists (2006), Wallace D, Parish E, Arnold GP, Drew TS, Cochrane LA, Abboud RJ. 3rd Clinical Biomechanics Conference (2005), Oparka R, Drew TS, Cochrane LA, Arnold GP, Abboud RJ. Are expensive training shoes worth the cost? 3rd Clinical Biomechanics Conference (2005), Grummitt S, Arnold GP, Cochrane LA, Drew TS, Abboud RJ. International Society of Prosthetists and Orthotists (2005), Birudavolu CR, Arnold GP, Drew TS, Abboud RJ. International Society of Prosthetists and Orthotists (2005), Kerr R, Arnold GP, Drew TS, Cochrane LA, Abboud RJ. International Society of Prosthetists and Orthotists (2005), Clinghan R, Arnold GP, Drew TS, Cochrane LA, Abboud RJ. 3rd Clinical Biomechanics Conference (2005), Oparka R, Drew TS, Cochrane LA, Abboud RJ. Health Foundation Conference (2004), Oparka R, Drew TS, Cochrane LA, Arnold GP, Abboud RJ. Scottish Orthopaedic Meeting (2000), Rajput B, Ramadhas R, Drew TS. XII Meeting of the World Society for Stereotactic and Functional Neurosurgery (1997), Forster A, Drew TS, Tulley M, Latimer M, Varma TRK.